Jaap Buitendijk/"Fantastic Beasts: The Crimes of Grindelwald"
Katherine Waterston as Tina Goldstein and Eddie Redmayne as Newt Scamander in "Fantastic Beasts: The Crimes of Grindelwald." 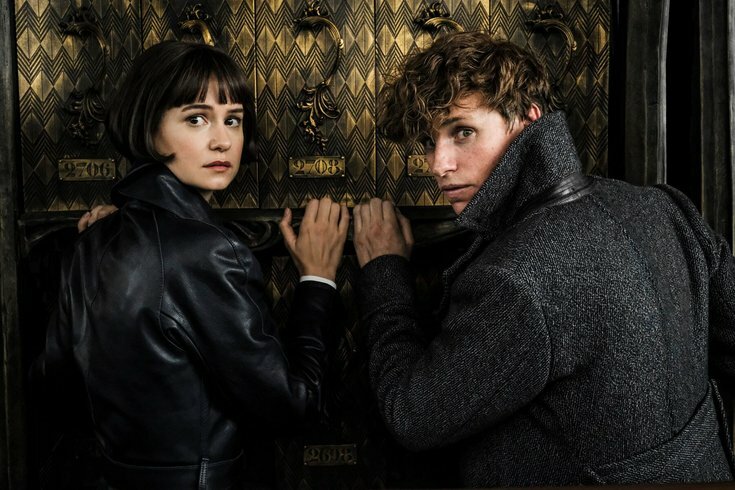 Muggles/No-Majs will be transported back to J.K. Rowling's Wizarding World this Friday, when the sequel to "Fantastic Beasts" officially hits theaters. "The Crimes of Grindelwald" picks up a year after the first film, with Albus Dumbledore enlisting the help of his former student Newt Scamander to stop dark wizard Gellert Grindelwald. The new film is a draw for young fans just starting to explore the Wizarding World, as well as grown-up "Harry Potter" fanatics eager to gain new knowledge on the Potterverse. For those adult fans, there's a special cocktail menu available at Movie Tavern. The chain offers in-theater dining, so movie-goers can enjoy drinks while watching "The Crimes of Grindelwald." All three cocktails are made with Slow & Low Rock and Rye and are inspired by drinks Potterheads should know: Butterbeer, Firewhisky and Gigglewater. The menu additions will be available from the film's opening day through Friday, Dec. 14. Movie Tavern has four locations in Pennsylvania. Find one in Flourtown, Exton, Collegeville and Allentown.